In an addition to the long list of cool things that will kill you, novelty drinking glasses apparently contain a dangerous amount of lead. 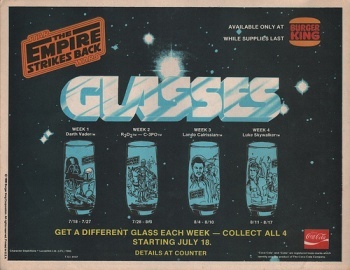 The set of Star Wars glasses that your parents stalked Burger Kings to collect for you might have been slowly killing you over the past 20 years. The Associated Press, concerned about the colored decorative elements of novelty drinking glasses, commissioned a study into the levels of lead involved in such novelty glasses. The news isn't good: the glasses contain dangerous amounts of lead and cadmium. AP reports that their testing "looked at whether glasses would shed lead or cadmium from their decorations during normal handling, as well as how much of the toxic metals those decorations contain." The good news is most of the lead stays attached to the glass, and very little will shed during normal use. The ramifications of the report actually hinge on the intended audience for the glasses, children or adults. The AP notes that, as a product for children, legally the glasses "couldn't have more than 0.03 percent lead. Lab testing commissioned by The Associated Press showed they contained up to 1,000 times that limit in their colored designs. If they were not children's products, there would be no limit." The A.V. Club notes "pretty much every decorative drinking glass ever made carries the same risk, dating back to nearly 50 years ago." United States retailers have begun measures to recall the more modern glasses from circulation.